Three Leaves by Helen Turner. 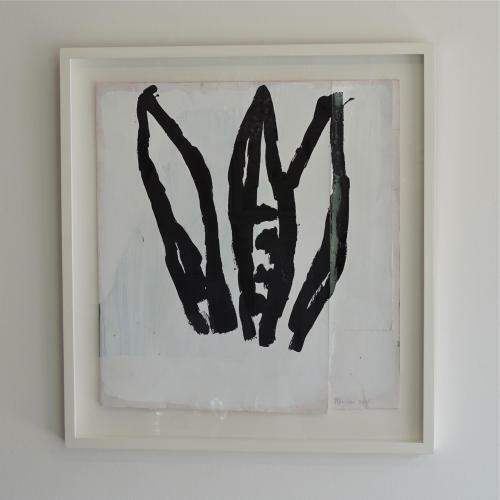 Black gloss on paper and mounted in a hand finished gesso frame with UV protected glass. Signed 2015.
yes Twombly, yes Schnabel, Basquiat not really. More, I’m struck by the complexity of her own contraptions of innocence – the way affordable cotton duck is flounced and glued so as to simulate a glam frock, or alternately the way a paper wrapping has been distressed so as to appear as dirt-cheap as possible. ‘Art’, meaning cunning, is the name of the game here. But this hunt for a different place, well to the side of painting, this swaggering, bomb-happy girliness that skids onto the strangest of formal hard shoulders – that’s what art means too, or at least what it ought to.